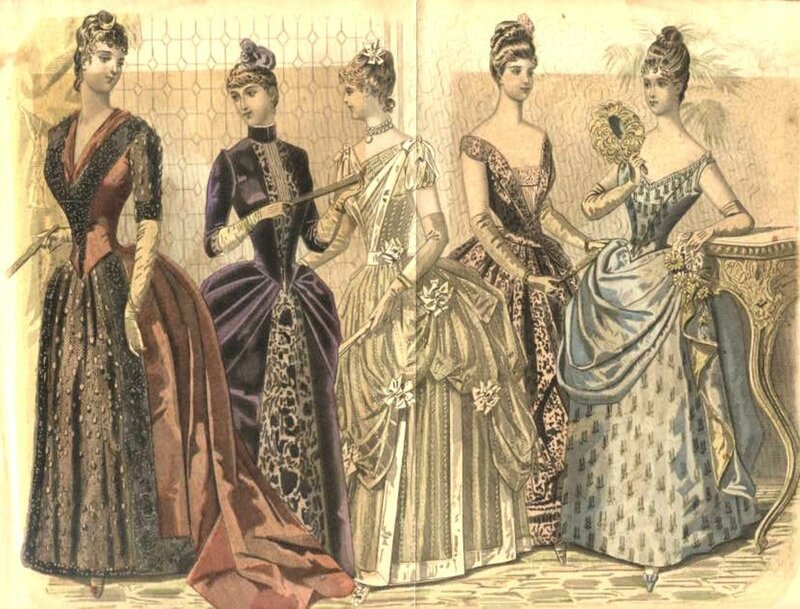 Women's fashions of the 1890s epitomized a new kind of woman. Romance was juxtaposed with practicality in sleek new styles. An hourglass silhouette defined the feminine form and women's clothing lost some of the restrictive aspects and over-ornamentation of the earlier Victorian era. The aging queen, once a symbol of all that was socially desirable, began to look quaint, becoming a symbol of everything old-fashioned. The Aesthetic and Reform movements of the mid-1800s crept into popular culture. Women wanted clothing that was less restrictive than in the past. This was due to a number of new ideas that liberated women. New health concepts encouraged women to become more physically active. More women entered the work place, went to college, and engaged in social issues than ever before. Women's garments reflected these popular new pursuits. The 1890s was an era Mark Twain christened "The Gilded Age," satirizing a troubled society rife with poverty over which stretched a veneer of false luster. Also called the Belle Epoque in France or the Gay 90s for its new sense of fun, the 1890s opened the door to the modern age. The Panic of 1893 closed banks and threw people out of work. Wealth flowed upward as the richest 10% owned 3/4 of the US wealth. A steady stream of European immigrants in search of better wages led to the opening of New York's Ellis Island. 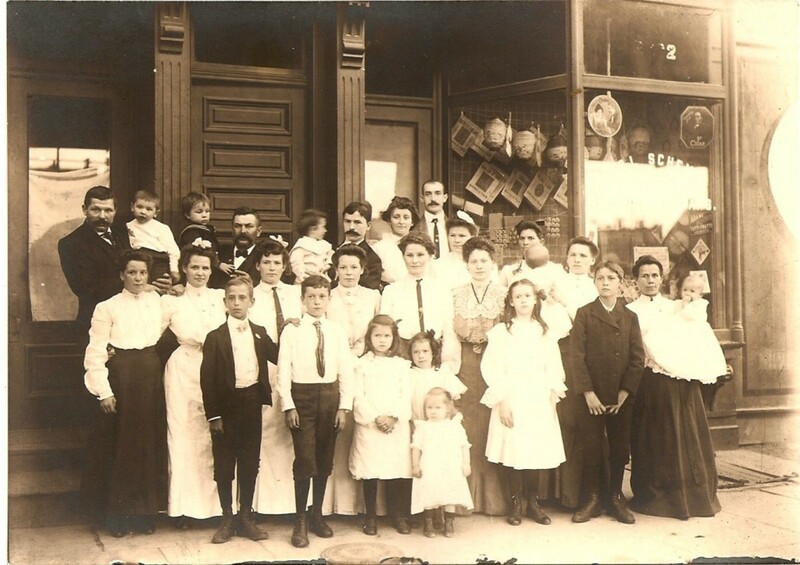 The 1890s saw the rise of the ready-to-wear garment industry and the rise of labor unions. It ushered in new concepts for entertainment, travel, and technology. The 1890s heralded the first moving pictures and the earliest automobiles. The birth of Ragtime music underscored a sense of frivolity and fun. Brilliant electric lights of the Chicago World's Fair in 1893 and amusement parks like Baltimore's Electric Park paved the way toward the electronic age. The widespread use of bicycles offered young women a new independence and mobility while suffragettes fought for women's right to vote and questioned a patriarchal culture. The well-to-do of the USA traveled to Paris for haute couture. Some wealthy and upper middle class women had their clothing made by dressmakers or hired their own personal seamstresses who created garments using sewing machines. By the 1890s, electricity was used in garment factories, fueling machines that cut through many layers of fabric. The piece work system created a demand for unskilled workers as each worker was responsible for only one step in the production of a garment. Mass produced garments were cheaper than hand tailored clothes, showing up in department stores and mail order catalogs. Women led more active life styles so had less time for sewing, creating a greater demand for ready-to-wear clothes. And new simplified garment designs made them easier to produce than the ornately draped, padded, ruffled, pleated, gathered, and heavily embellished dresses of the 1870s and 80s. 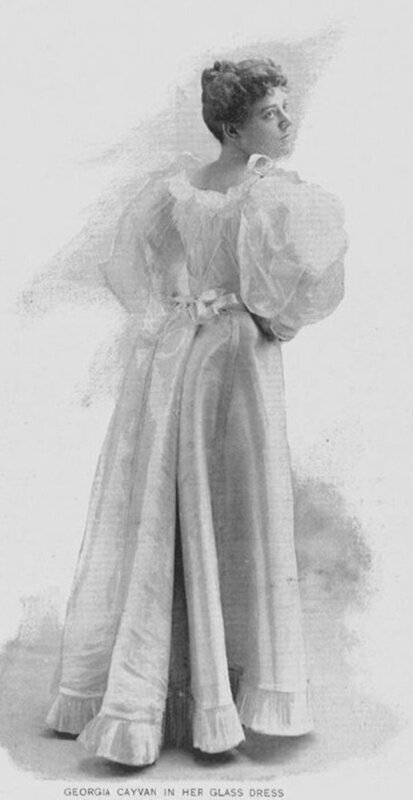 By 1890 the bustle and ornate skirt drapery was in decline. While skirts and dresses had some pleating at the rear, the emphasis on the rear gradually diminished. Gored skirts were long and tight at the waist. Fabric cut in a long triangle with the top cut off created a slim waistline so skirts fit smoothly over the hips, the flared out in an inverted tulip shaped bell. Some skirts featured bands of buckram or heavy linen around the hem. The hem band enabled women to easily repair a damaged hem. 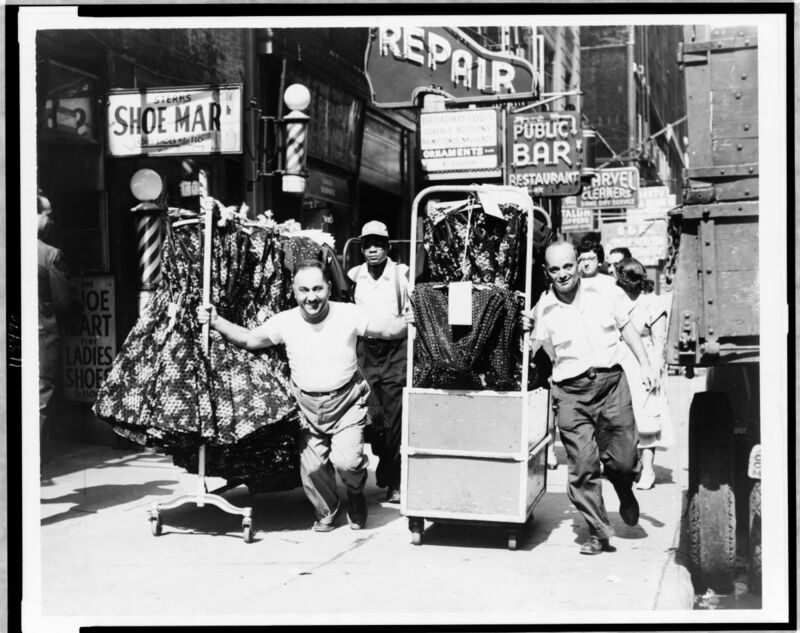 Trains were popular and even worn on the streets though dress reformers argued against the unhygienic practice of dragging one's clothing through dirty streets. Though fashion plates depict women wearing floor length hemlines, photographs of women at work, or engaged in physical activities show shorter hemlines. 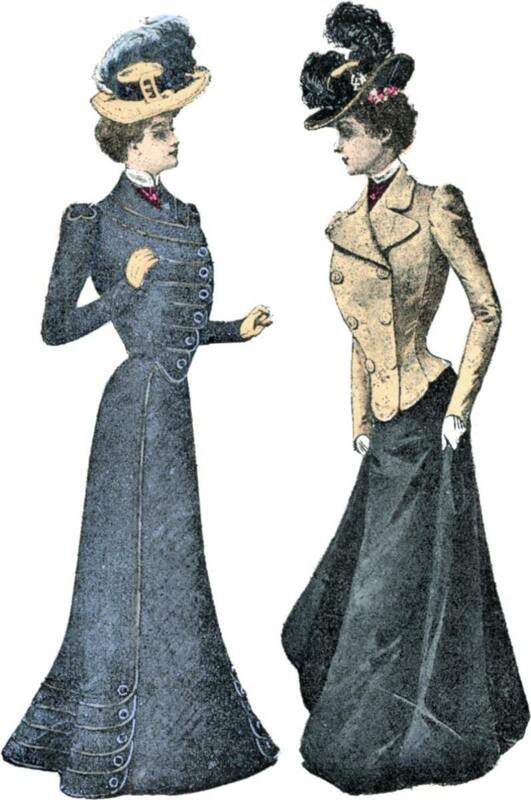 For day, women usually wore two piece outfits consisting of a skirt and bodice or shirtwaist. A bodice was a tight upper body garment often supported with built in whalebone. A shirtwaist is similar to a man's shirt, but with added embellishments. One piece gowns were worn for evening attire. Large puffy sleeves ended at the elbow. When the size of day wear sleeves diminished, so too did the sleeves of evening gowns. Evening dresses featured low necklines which could be rounded, V neck, or square necked. Lace was popular for decoration and many gowns were made entirely of lace. The shirtwaist was a hot commodity of the 1890s. Entire factories ran on the production of shirtwaists. This day wear staple featured a high neck, often trimmed with ruching, ruffles, ribbons, or lace. A shirtwaist differed from the bodice of earlier times. A bodice refers to the top portion of a dress, from waist to shoulders. Bodices were often sleeveless. One could attach and change sleeves. 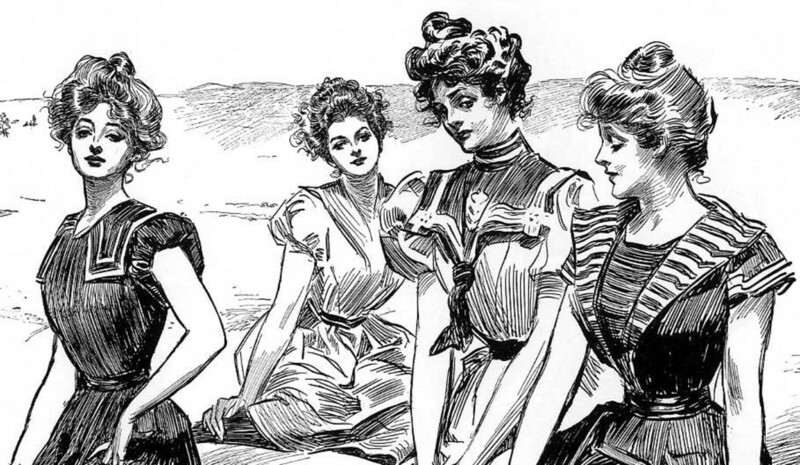 Bodices were supported with whale bone while a shirtwaist was more like today's blouse. Sleeves called leg-o-mutton erupted like huge balloons at the shoulder, then tapered down toward the wrist. By 1894, the puffiness grew so large that sleeves needed support from balled cotton or stiffening. Shirtwaists were yoked in the early 90s. The yokes were often edged with ruffles. Some shirtwaists were man tailored and quite plain while others featured copious embellishments. Outside the home women wore suits consisting of a matching skirt and jacket worn over a shirtwaist. Jacket shoulders and sleeves were large enough to accommodate the large puffed sleeves. Suits were constructed of tweeds and heavyweight fabrics. Summer suits were made of lighter fabrics like linen. The suits could be simple, based on menswear and made by tailors instead of dress makers. Some suits featured decorative embroidery or were elaborately embellished with ruffles and lace. Tea gowns allowed women comfort and freedom of movement. Born out of the Aesthetic and Dress Reform movements, tea gowns could be donned with out assistance and came in many styles. Some resembled a combination of a bath robe and a ball gown. Undefined waists could be worn loose or cinched with a belt or sash. Princess line tea gowns with long, flowing sleeves hinted at medieval costume. Tea gowns could feature Empire waists, trains, flounces and Watteau pleats (a large pleat extending from the top of the dress). Some tea gowns came in floral patterns. They could be sensible or elegant. Originally worn at home in the morning or to receive friends for tea, by the 1890s, tea gowns increasingly appeared outside the home in summer at at seaside resorts. Women also wore tea gowns to dine at home. 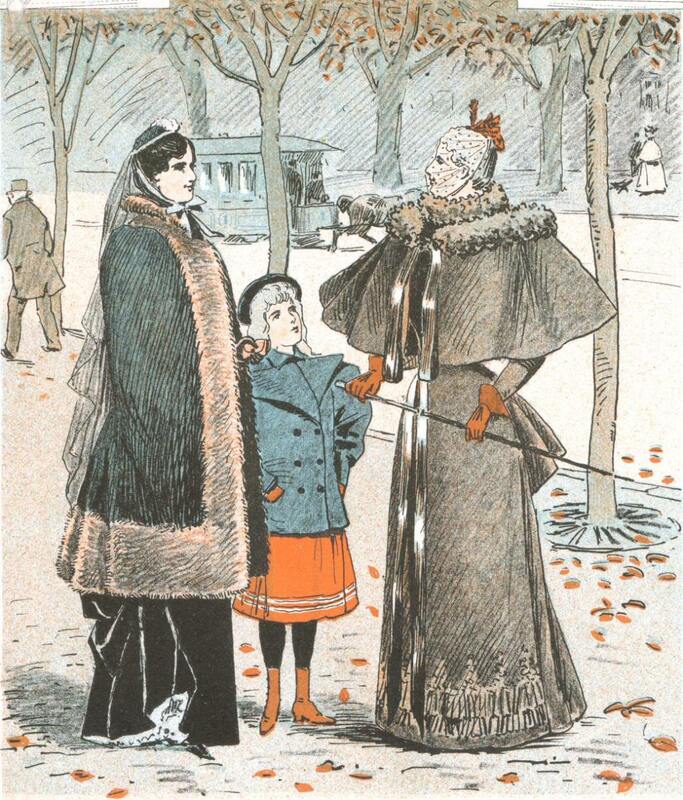 Women wore coats and capes in cold weather. Large shoulders and sleeves emphasized an hour glass figure. Capes could be full or hip length. 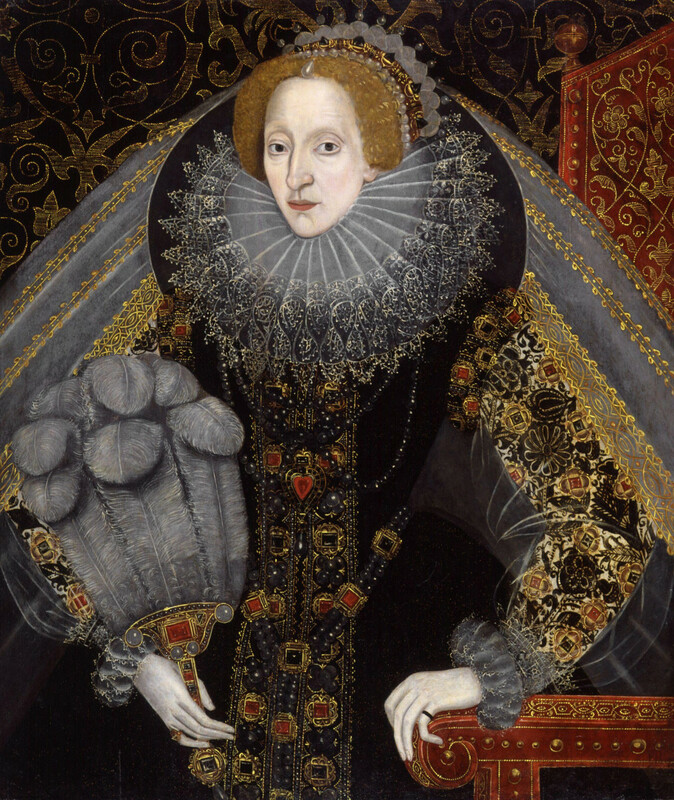 Collars stood high or featured a tall ruffle that covered the neck. Made with velvet or plush, capes were often trimmed in fur, decorated with beading or embroidery. Short coats hung hip, 2/3, or full length. Chesterfields were popular and could be simple and similar to the men's coats of the day. A new emphasis on active sports and the interest in rational dress lead to a market for garments that were appropriate for a more active life style. While women formerly participated in equestrian sports or the more sedate croquet, young ladies of the 1890s began to engage in a wide variety of activities. 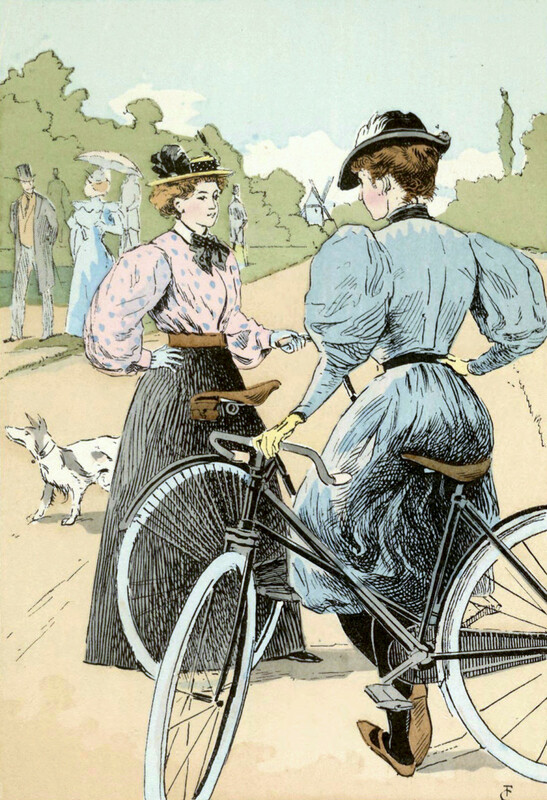 Bicycles were all the rage and could be ridden with difficulty by a woman in a skirt. Cycling was easier while wearing puffed knickerbockers. Divided skirts with shorter hemlines allowed women to ride comfortably astride a bike. The divided skirt look like a normal, full skirt when a woman dismounted. Sportswear appeared to accommodate women's interest in tennis, golf, hiking, and roller skating. As women increasingly attended college, schools offered women's gymnastics and team sports like crew, baseball, and basketball. While swimming was rare for women, dips in lakes and the sea were seen as a healthy practice. Bathing costumes reflected the popularity of puffy sleeves and modesty. Women wore short bathing dresses with tight waists and knee length bell shaped skirts. Sleeves stopped at the elbow. 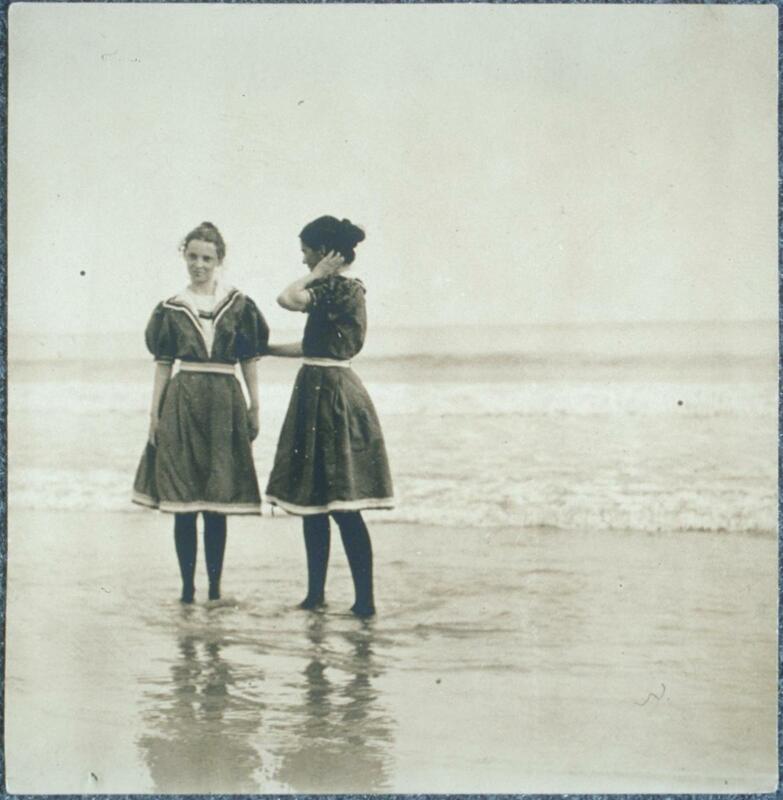 Swim dresses were often worn over bloomers. Occasionally knickerbockers appeared in place of a skirt/bloomer combination. Bathing shoes and black stocking completed the ensemble. Women's shoes and boots sported medium, chunky high heels. Slightly rounded toes appeared for day and evening wear as well as in boots. 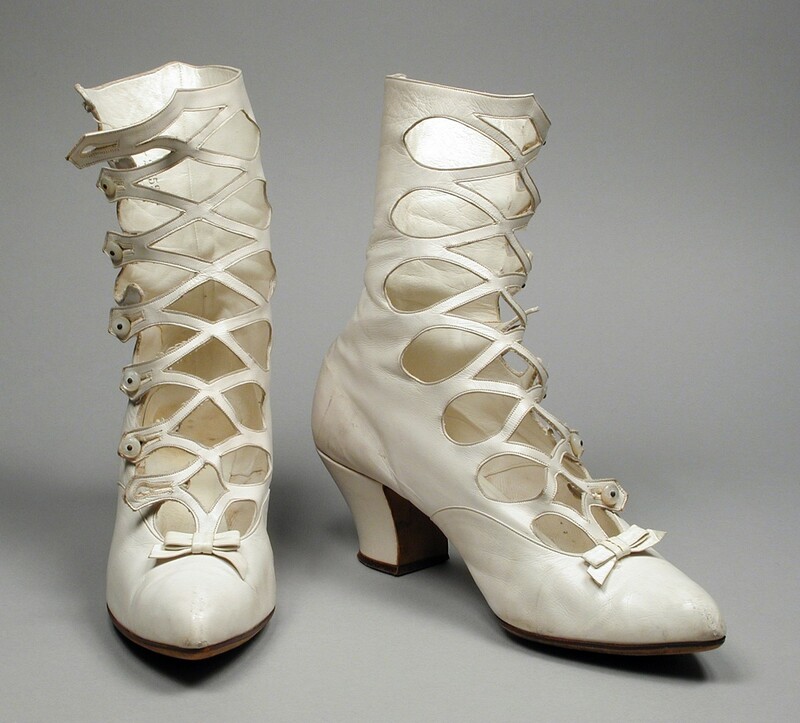 Boots featured lace-up or button closures. Cotton stocking were worn during the day while evening stockings came in silk. Some colored stockings were worn, especially for evening though black black predominated. The use of cosmetics was generally limited to slightly tinted powders and face creams. 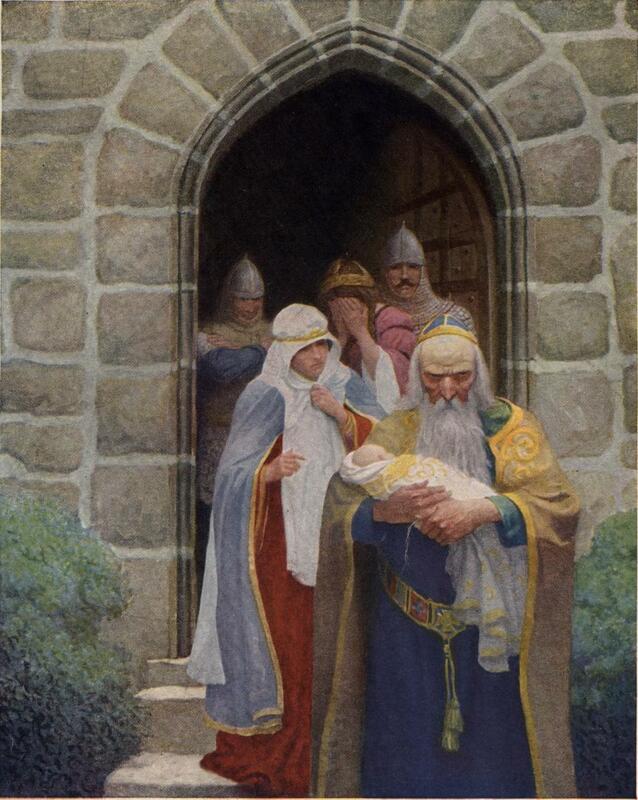 Women kept their hair long but only young women wore long tresses. Grown women wore a puffy upswept style twisted into a coil at the top of the head. Women often wore short, curled bangs. Small hats came in brimmed or brimless styles. Face veils complimented these small hats. Elaborate decorative elements included complicated piles of ruffles, bunches of lace or artificial flowers, netting, and feathers. Decorations often rose high above the hat's crown. The demand for plumes for the hat industry decimated America's wild bird population. 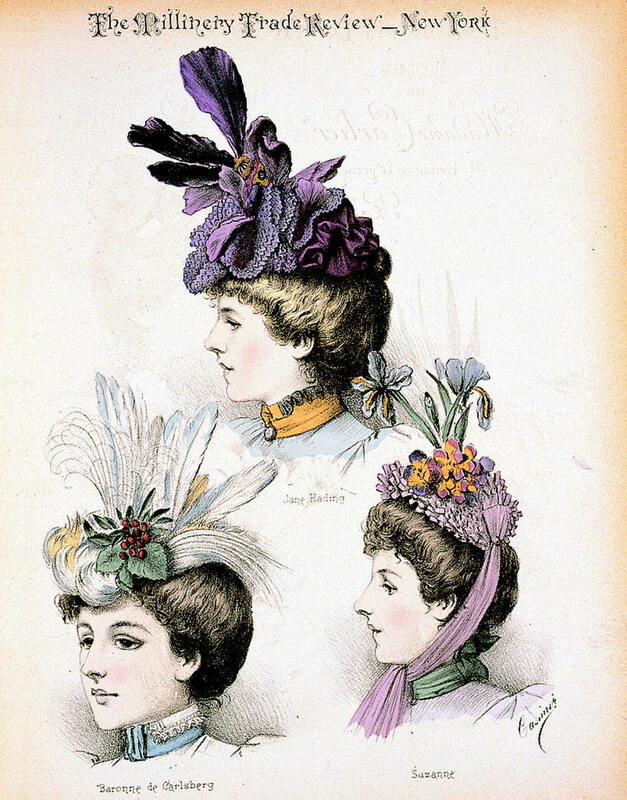 Large garden style hats became popular as the decade progressed. Styles ranged from fairly simple to highly ornate. Straw boaters and fedoras were popular and usually worn with few simple embellishments. 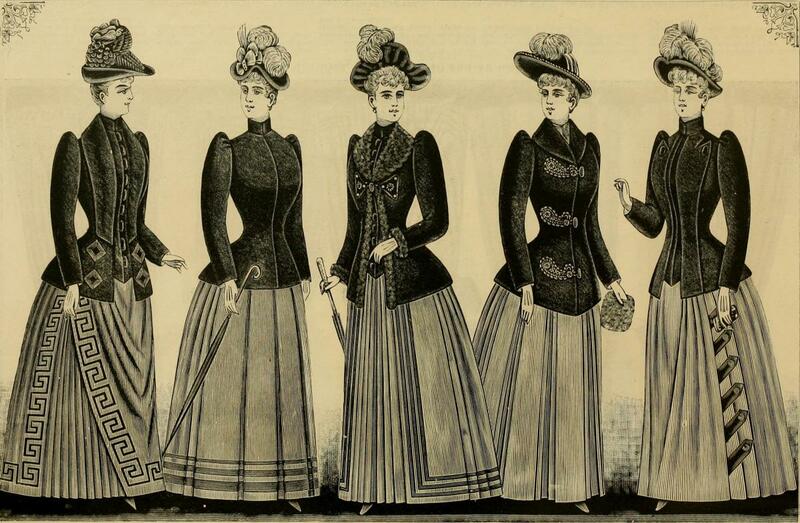 In the 1890s, a fashionable lady needed help getting dressed. A ladies' maid assisted a woman to don her many layers of undergarments including stockings, chemise, drawers, corset, and petticoats. The corset grew somewhat smaller than in the past with the top reaching just below the bust. 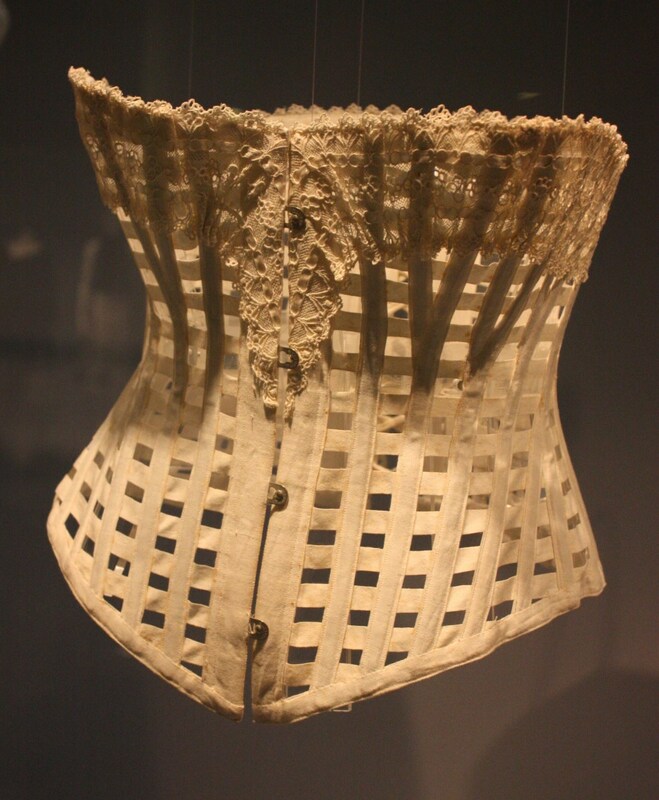 Corsets made of layered fabric and stiffened with whalebone, steel, or cane drew criticism. Health professionals, social advocates, and reformers objected to corseting as well as the cumbersome layers of undergarments worn by fashionable women. Tight corsets restricted breathing and movement. A woman could not even bend over to put on a pair of shoes! The corsets and layers were hot in summer. 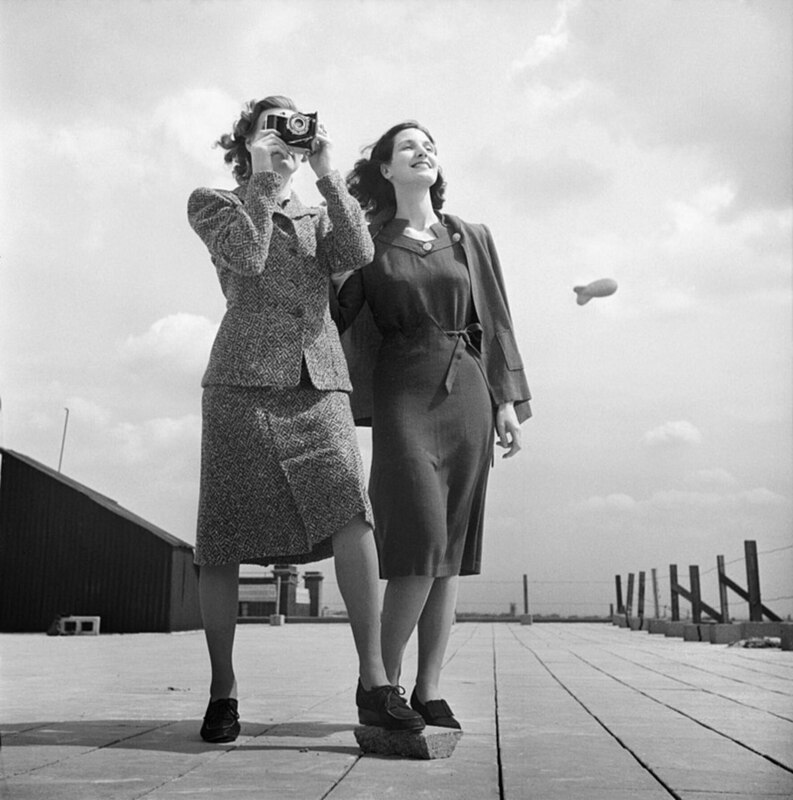 Some critics felt that women looked unnatural and ridiculous. Health advocates like Dr. J. H. Kellog believed that corseting ruined a woman's musculature. While the corset industry claimed women needed support, Kellog thought that women should use their own muscles to achieve a correct posture. While one camp worked to reduce the vast amount of undergarments women wore, new designs introduced new bust supporters padded to correct developmental deficiencies. 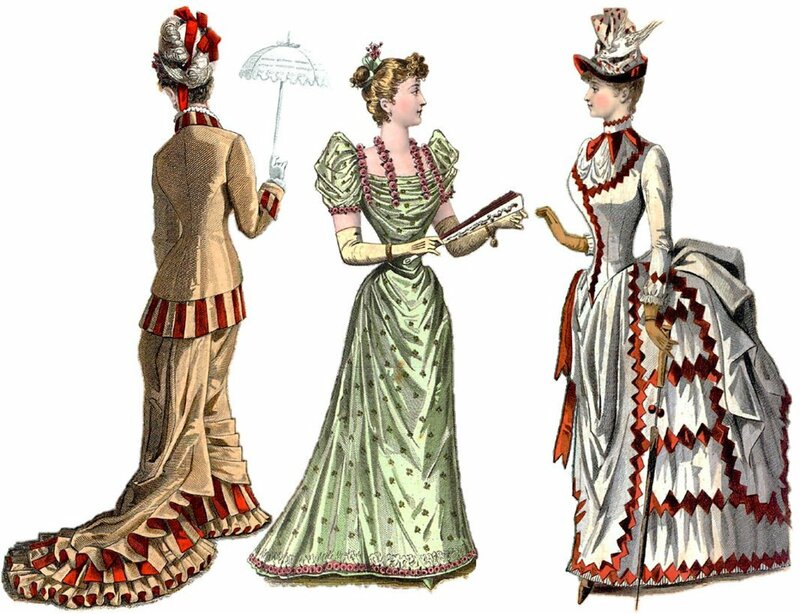 Fashions of the 1890s reflected a new view of women. Earlier Victorian styles restricted movement. This enforced docility emphasized the point that an upper class woman did little but sit around drinking tea. The ability to reach, bend, or twist had been previously reserved for the working class. Well to do women were supposed to be passive. As fashionable young women began to emerge from the cocoon of passivity, styles changed to accommodate comfort and movement. Hi Katharina J - that sounds like such an interesting job! I would think that you could find some information from your local historical society. In general women who worked in those days dressed differently than the urban elite. Women who worked on farms would only wear a corset to go into town or for special occasions as they restrict movement. Their hems were higher, at or slightly above the ankle. Their clothing needed to be loose enough for hard work. Outdoors, they would wear bonnets to protect their skin and eyes from the sun. Boots would have laced up the front. "No Lady of Leisure: Clothing for the Victorian and Edwardian Working Woman" by Marna Jean Davis. This article is wonderful! I've always been interested women's fashion throughout history, but now I have an opportunity to incorporate it into my job. I'm working at a living museum that is a farm from around 1884. I was wondering, what kind of clothing would working American women wear? Specifically kinds of boots and corsets. We have a lot of resources at the farm, but not enough to be sure that we are presenting the fashions correctly. I'd be so grateful for some input! Hi Peggy - it seems like they'd be torn up too. I remember being young and wearing pants that were too long. It did not take long to mess up the hems. But trains have come in and out of style and seem to work indoors for formal occasions. I had a bit of a train on my vintage wedding dress. What a pain! This is so interesting how fashions reflected the times and how women participated in society. That remark about the dresses with trains being unsanitary is so true. Just imagine what those trains would have picked up from being dragged in the streets! Hi Flourish Anyway - thank you! I too love the old fashions but would not be happy wearing them myself. My favorite period is 1912 or so into the 1920s when things loosen up a bit. Hi Dora - I remember when I was in the 9th grade, I noticed that lots of the girls wore girdles (the corset of the day). I thought it was ridiculous. So many of them were so skinny, what was there to hold in? In Victorian times the idea was that women were so weak they could not maintain correct posture without corsets. Of course this was the concept sold by the corset and fashion industry. Hi Anne - it's pretty but still pretty uncomfortable. This corset is also suggested for exercise. Sure. I'd rather just exercise. Love the ventilated corset - why did I never think of that! A fascinating article. The clothes look so elegant, but I prefer the ease of today. Imagine the kind of corsets women today would have to wear in order to look half as shapely. Still, I like the idea of clothes that kept the body (not necessarily the hands and feet) covered. A healthy balance between now and then would accommodate comfort and movement while maintaining decency. This article gives us women so much to consider and discuss. Thank you very much for this informative presentation. 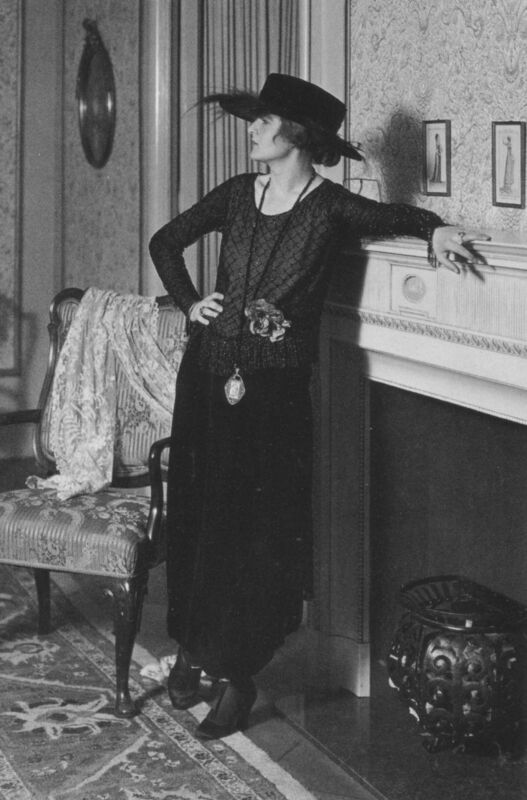 I love your fashion articles, and this historical period is among my favorite. From the hair to the hats (no birds for me though)to the shoes and puffy sleeves I can just imagine donning all this and laying back on my fainting couch. Love it all but thankful to be a modern woman with rights.